Our cats are outdoor cats, AKA “barn cats”. They live outside, guarding the homestead from mice, possums, and other creatures that could threaten our chickens or bees. They are important on our homestead for this very reason. We love them as pets too…when they “allow us” to love them. During the summer they are happy as larks to be outside doing what they want, when they want. That is the true way of the cat, is it not? Cats are rather independent creatures and like it just fine that way. They can sleep in the cool of the dirt in the mint garden during the hot of the day or find a mouse to play around with. Need your barn cats to hunt those mice? Read this post here to see how to get them to do just that! They can stalk the chickens or ducks if they want, climb a tree, or walk along the fence tops. We don’t have to worry about them freezing or their water dish turning to ice in the summer time. 1. Keep the barn door open a crack. We leave the chicken barn door open enough for the cats to slip through and sleep in the warmth. With the chickens and the bedding on the coop floor, it makes a pretty nice place for our feline friends to sleep if they so choose. A bonus to this is that they can catch any mice before they wreck havoc in the chicken feed. 2. Keep their drinking water from freezing. This isn’t hard, really. Our cats have a plugged in heated water dish to keep their water from freezing. We use this one here. If you don’t have one of these, or live off grid, you can simply add warm water to their water bowl when you go outside to do chores. 3. Give them a warm place to sleep. (If you don’t have a barn or coop) Not everyone has a large chicken coop or a barn on their homestead for a cat to sleep in. If you have an outdoor cat in this situation, you’ll need to provide a warm place for them to sleep. We made a “home” for our outdoor cats on our front porch. It is made out of an old 35 gallon Rubbermaid container. You can do this too by simply cutting a hole in the side for the cat to get in and out, then securing the lid on tight. We taped cardboard inside to help insulate it, and when we can find straw bales, we surround the container with those for even more protection. 4. Add extra dry food to their dish. In the summer, our outdoor cats can add to their diets by catching and eating mice, birds, etc. In the winter, when prey is a bit more scarce, we make sure to keep their food dish more full. This will give them the extra calories they need to stay warm in the cold, winter months. One note here: I can’t keep the cat’s dry food near the chickens. The chickens will fight the cats off to eat it. Got other animals on the homestead? Read more about their winter care here. 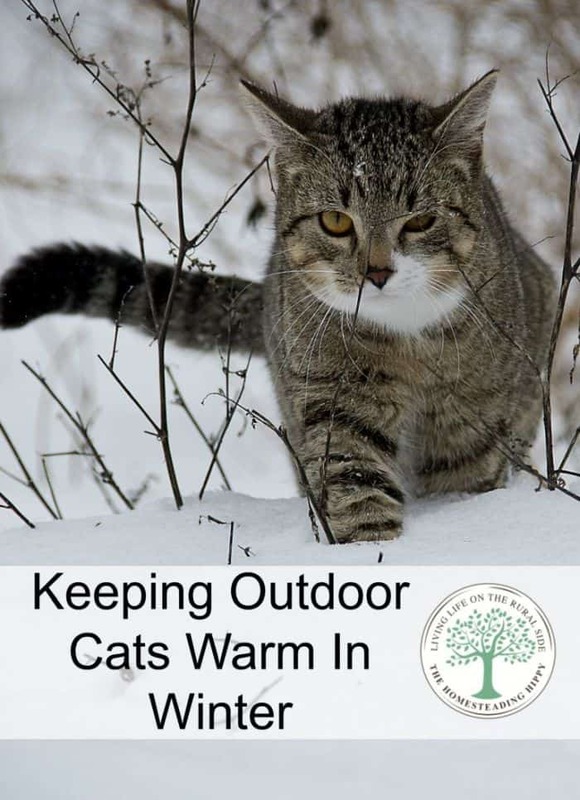 What do you do to keep your outdoor cats warm in the winter? Be sure to pin this for later! My husband built a large shelter that we laughingly call the “MPF,” which stands for Multi-Pet Facility. It’s actually a very large dog and cat house. My husband built some upper catwalks especially for the cats where the dogs can’t get to their food. I’m glad they have a place to get out of the weather. Since your cats are barn cats, how do you keep them from attacking the chickens? Mine have never messed with the chickens. One DID go after a duck–once. The duck fought back and the cat never bothered them again. I don’t have electricity outside or a way to get it to my cats water bowl. How can I keep her water from freezing at night? I also have a small dog house with a self heating pillow inside. Will this be enough for her in 14 degree weather? ?